Redeemer is an outstanding educational program that serves students in our 4-year-old kindergarten program through the eighth grade. Our extended school care program is available to students from 6:30 a.m. to 6:00 p.m., so parents always know their children are safe and cared for. 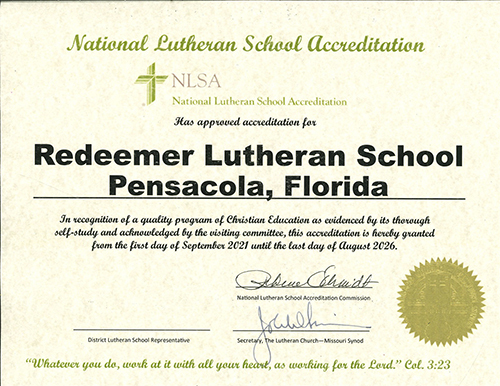 Redeemer Lutheran School was organized in 1955 as a Christian school to serve the spiritual and educational needs of Redeemer Lutheran Church and our Pensacola community. It began with its first kindergarten class that September under the direction of Mrs. Mira Strohl, a long-time music education teacher from Escambia County Schools. Master the fundamental skills of reading, writing, and effective oral communication. Develop a sound understanding of mathematics and natural sciences. Develop a thorough knowledge and appreciation of the social sciences and the arts. Acquire an enjoyment of learning, physical activity, and participation in team sports that will continue throughout their lives. Develop effective study and work habits, problem-solving skills, and the ability to interact and work well with others. Treat others with respect and love at all times, and be fruitful servants in their church and community. Acquire a thorough knowledge of the Bible and basic Christian doctrine. Develop a personal and real relationship with God that permeates into all aspects of their lives.